Tourist Map of Switzerland, published by Swiss Federal Railways, Berne 1932. Designed by Kümmerly & Frey, Berne. Switzerland Alpine Postal Motor Coaches - Summer 1935. Published by the company, printed by Roto-Sadag S.A., Geneva. Offizielle Strassen-Informationskarte der Schweiz, circa 1935. Printed by Vogt-Schild A.G., Solothurn. 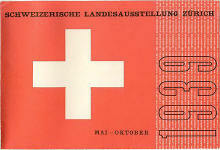 Schweizerische Landesaustellung Zürich, Mai-Oktober 1939 (Swiss State Exhibition). Front cover. Travel brochure to the Lake of Lucerne, circa 1932. Published by the Lake of Lucerne Steamship Company. Chamonix-Mt. Blanc et sa vallé, 1931. Published by the town, signed "Borline." Front cover. Chamonix-Mt. Blanc et sa vallé, 1931. Published by the town, signed "Borline." Front cover. 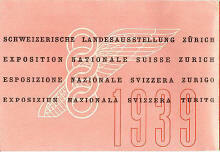 Schweizerische Landesaustellung Zürich, Mai-Oktober 1939 (Swiss State Exhibition). Back cover.